Wow...has it really been a month since my last post?! Time flies with a newborn! Well, sometimes it does. Then other times it seems like we're frozen in time. It's nurse him, burp him, make faces to entertain him, change his diaper, put him down for a nap, then rinse and repeat! Every second of it is bliss, though. . .even those fun 2:00 a.m. feedings and diaper blowouts! Being the insanely proud parents that we are, Adam and I decided to invest in a really nice camera for capturing all of life's moments. Adam picked out a Nikon D-5100 digital SLR camera, and we (especially I) am in LOVE with it! Of course, now Adam is afraid he's created a monster. . .a photography monster, that is! I think I've taken pictures with it just about every day of William's life! Let's back up a bit to the week we brought him home from the hospital. Adam found an awesome deal on Amazon for a photo studio of sorts, and it arrived a couple of days later. It came with 2 different backdrops (a black and a white), 3 light tripods, 3 photography bulbs, the little umbrellas that attach to the lighting tripods- I'm telling you, this thing is the Mack Daddy whole kit and kaboodle! Our dining room was in transition at the time (we had sold our previous dining room furniture and had not gotten the new stuff from his aunt yet so the room was empty), so it became the photo studio. We did the first "photo session" on September 8. Little William was a young 10 days old! The photos turned out so good. I was impressed with Adam's camera skills. Here are a few of our favorites. . .
Our next purchase will probably be Photoshop or soft boxes for the light bulbs. We would also love to have the extra lens that is especially for wider shots to take full-body pictures, but it's about $1,200 so we'll have to wait a little while before making another big investment like that! In the meantime, we can rent one when we are going to have another photo shoot. The frame was another task in itself. I searched online and visited several stores (Michael's, JoAnn, Things Remembered, Dillard's, Kohl's, Marshall's. . . all with baby in tow) before finding the perfect one at Hobby Lobby. And the best part- it was 1/2 off frames week! I wanted something for him to put in his office at work (there was only 1 picture on his desk from some golf tournament before this), and I didn't think he would want a huge panel frame. I wanted something tasteful and masculine that he could display on his desk. That's when I found this cool rotating hexagonal frame box! Each photo slot was a 3" by 3", so I formatted the pictures above using Microsoft Publisher so that each one was exact to those measurements, and I printed them on one 8 x 10 photo sheet at Kinkos. Then I just cut them apart and slid them in the frame. 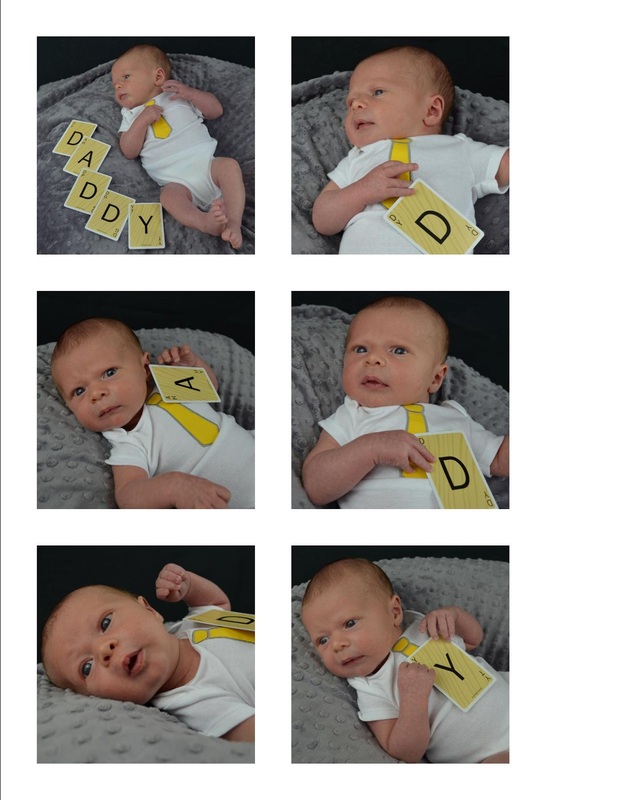 It had exactly 6 openings, so I used the 5 letter poses and one final pose with the word "Daddy" going along the side of William's body. We took Adam out to lunch at Rafferty's that day, and William gave Daddy his gift. Adam absolutely loved it! Even more than the frame, though, I think he loved having a special lunch date with Munchkin. The photo studio has been packed up and tucked away for the time being, but it will make its appearance again soon enough. 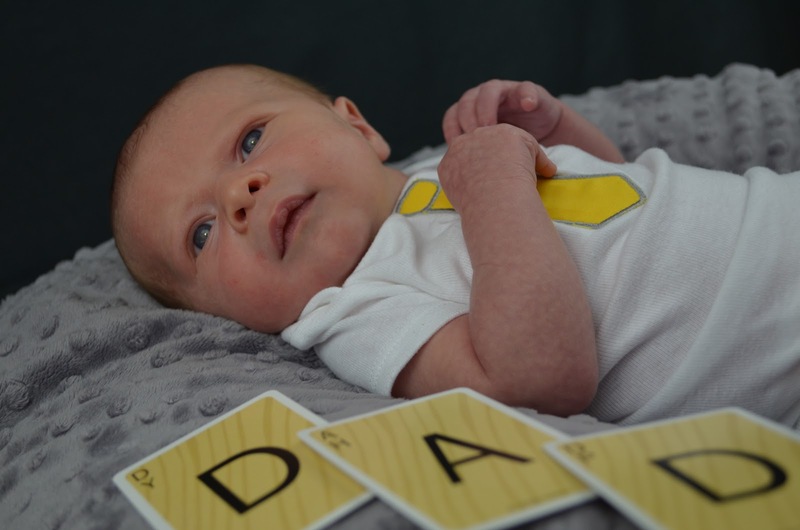 William will be 8 weeks old this Wednesday, and he'll hit the 3-month milestone soon enough. He gets his first round of ammunition...I mean immunizations...this Friday! Then Adam will let me take him out in public around people we know and our friends' kids will finally get to meet him! We also have his first vacation coming up in the near future, so I'll have something else to blog about soon enough. Oh, and remember that candy corn costume I've been working on? Well, it's still not finished, but it will be before the big day at the end of this month! I'll be sure to share that too, upon its completion. Until then, I'll leave you with a few last pics of our adorable little guy. Ciao! Very cute! You might go with Lightroom, it's cheaper than Photoshop and a lot of photographers use it.